When all the grilling, midday cocktailing and potato salad leftovers call for the occasional outdoor nap. Just you. A couple of trees. The wind. And an old barrel of wine. Presenting the Barrel Stave Hammock, a new leap forward in the evolution of hammocks using wine barrels from California, available now. This sort of feels like something MacGyver (or at least MacGruber) would concoct at someone’s lake house after discovering an old wine barrel in the basement (probably right after he turned a pen, a Jack Russell terrier and an old carburetor into a functioning tank). Only this is no crude invention. Long after the wine has been removed, the 22 barrel staves are sanded down and smoothed to body-contour-correct levels. Then, they’re assembled using durable, thick manila rope, and lacquer-sealed against harmful outdoor elements (or in lounging terms: spill-proof). The subtle curve of the barrel and the evenly spaced staves are natural complements to the arch of your back (and should go well with your burgundy-colored chinos). 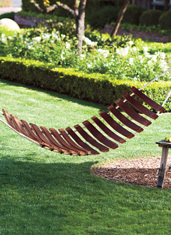 So think of this as your stylish go-to for hammocks should you have: a) a place for hammocks, and b) $499. Next up: the keg trundle bed.